Order online, or if you prefer, give us a call. We are open M-F 9:00AM - 5PM CST. LOCAL PICKUP's: Enter coupon code: LOCALPICKUP . This will give you free shipping, but it MUST be picked up if this coupon is used. Shipping quotes for outside the US are available via phone or email. 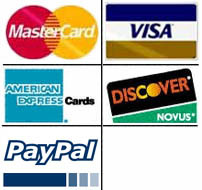 We accept: Visa, MasterCard, Discover, Amex, Money Orders, Personal Checks and PayPal. Please allow 2 weeks for personal checks to clear. All ShrockWorks products are individually handmade to order by skilled craftsman in in Houston, TX USA. Please call for current production times..